Torrone Nougat for sale. Buy online at Zingerman's Mail Order. Gourmet Gifts. Food Gifts. David Barbero’s family has been making torrone hazelnut nougat for five generations in the town of Asti since 1883, but neither the history nor repetitiveness seems to dull his passion. First off, I love the fact that he mentions lunch. More importantly, he's dead true, especially when it comes to texture. 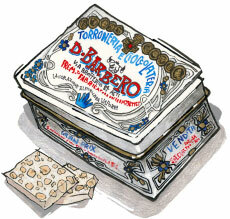 Barbero torrone is gently crumbly, in a shattering, delicate way. Delicious, spiked with loads of famous Piemontese hazelnuts that are roasted in house every morning, then hand selected and folded into the nougat. In their classic Northern Italian graphic-designed tin (500 g tin illustrated), it makes a great gift. Or new this year, an 8-inch long bar, enrobed in chocolate, makes a great stocking stuffer. The 500 gram tin's nougat is covered in thin, edible rice paper. "I am a fiend for torrone, buying it every time I see it. I’ve tried some fairly expensive, imported torrone before, but nothing I’ve ever had compares to the ambrosia that I just received. I am ruined for life, and it is all your fault."